Repeat the grant for each database whose schema you are converting. If your application runs on a Windows-based intranet, you might be able to use Windows Authentication for database access. Windows Authentication uses the current Windows identity established on the operating system thread to access the SQL Server database. You can then map the Windows identity to a SQL Server database and permissions. To connect to SQL Server using Windows Authentication, you must specify the Windows identity that your application is using. You must also grant the Windows identity access to the SQL Server database. SQL Server has two modes of access: Windows Authentication mode and Mixed Mode. Windows Authentication mode enables Windows Authentication and disables SQL Server Authentication. Mixed Mode enables both Windows Authentication and SQL Server Authentication. Windows Authentication is always available and cannot be disabled. For more information about Windows Authentication, see the Microsoft Windows documentation. In JDBC connection string, the parameter integratedSecurity must be specified to connect using Windows Authentication. The JDBC driver supports Integrated Windows Authentication on Windows operating systems through the integratedSecurity connection string parameter. Copy the sqljdbc_auth.dll file to a directory on the Windows system path on the computer where the JDBC driver is installed. -variable name: SQLJDBC_AUTH_HOME; variable value: D\lib\JDBC4.1\enu\auth\x86 (if you are running 32bit OS) or D\lib\JDBC4.1\enu\auth\x64 (if you are running 64bit OS). This is whe your sqljdbc_auth.dll is located. ensure that in your jdbc library folder, you only have SQLJDBC4.jar. Please remove other sqljdbc*.jar file from that folder (or copy to other folder). If you are adding the driver as part of your program, please ensure that you add only SQLJDBC4.jar as driver to use. copy sqljdbc_auth.dll the file in the folder with your application. If you are running a 32-bit Java Virtual Machine (JVM), use the sqljdbc_auth.dll file in the x86 folder, even if the operating system is the x64 version. If you are running a 64-bit JVM on a x64 processor, use the sqljdbc_auth.dll file in the x64 folder. 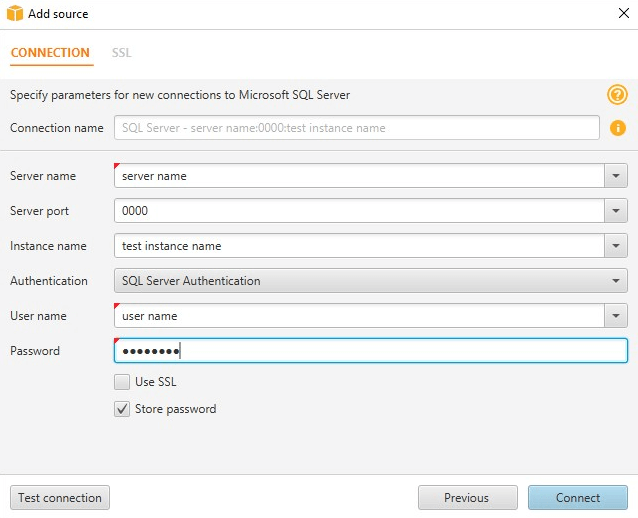 When you connect to a SQL Server database, you can choose either the Windows Authentication or SQL Server Authentication for the Authentication option. Use the following procedure to connect to your Microsoft SQL Server source database with the AWS Schema Conversion Tool. In the AWS Schema Conversion Tool, choose Connect to Microsoft SQL Server. The Connect to Microsoft SQL Server dialog box appears. Provide the Microsoft SQL Server source database connection information. Use the instructions in the following table. Type the Domain Name Service (DNS) name or IP address of your source database server. Type the port used to connect to your source database server. Type the instance name for the SQL Server database. To find the instance name, run the query SELECT @@servername; on your SQL Server database. Type the user name and password to connect to your source database server. AWS SCT uses the password to connect to your source database only when you create your project or choose the Connect to source option in a project, where source is your source database. To guard against exposing the password for your source database, AWS SCT doesn't store the password. If you close your AWS SCT project and reopen it, you are prompted for the password to connect to your source database as needed. Trust Server Certificate: Select this option to trust the server certificate. Trust Store: The location of a trust store containing certificates. Trust Store Password: The password for the trust store. AWS SCT creates a secure vault to store SSL certificates and database passwords. Enabling this option lets you store the database password and to connect quickly to the database without having to enter the password. Type the path to the driver to use to connect to the source database. For more information, see Installing the Required Database Drivers. If you store the driver path in the global project settings, the driver path doesn't appear on the connection dialog box. For more information, see Storing Driver Paths in the Global Settings. Choose Test Connection to verify that you can successfully connect to your source database. Choose OK to connect to your source database.